Fabric & Construction: Tough 500d durable nylon with 1000d shoulders. Abrasion-resistant and water-resistant. Functions: Choose a vest, or jacket with zip-off sleeves. And choose waist options of either a 2” elastic waist at bottom, or a stretch adjustable shock cord at bottom. Loaded with function and has 13 pockets, and thin hood that pulls from inside collar. Other standard features include external radio straps, clear vinyl name-tag slot Your logo / patches embroidered and taped in production with large orders. Lining: Breathable brush Tricot body in vest. With 210T sleeves for warmth and movement on the jacket with zip-off sleeve options. Accessories / Layering: Patrol Softshell or Fleece jackets are available in same colors. Some “Standard” options available, for immediate purchase at the MU Online Store. Sizes: Available in sizes xs – 4XL. 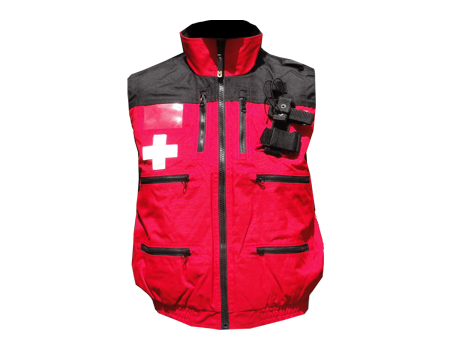 Colors: Rescue Jackets and Rescue Vests are standard in red/black and include reflective crosses on right front chest, and back. Red/Black items are also Standard Item available without crosses. Same design is also available Black/Black (no crosses). See Radio Jackets and Radio Vests. Special colors can be ordered in advance for quantities of 50+. Ordering: Get this item in Standard Colors at the MU Online Store now, or call to reserve larger quantities in advance. Group orders of 50+ should order in advance in spring, for fall / winter delivery.